5T0SP Mauritania. New one confirmed rtty mode. This dx-Group have later been activ as J88HL and VK9XSP. Great team ,fun to work and hope to hear you again soon. 5U5U on 17 + 20 mtr rtty. New 1 rtty mode #233. JG8NQJ/JD1 on 17 mtr cw it's Take from Minami Torishima. Nice one. DL7DF and team is activ from OX-land. 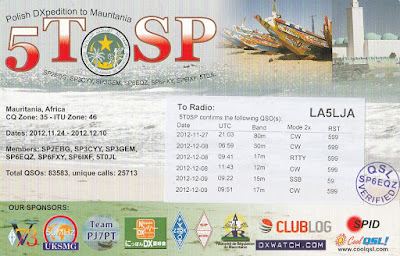 Qso's on 15+40 rtty and 17 cw.